I chose to do a pattern from Vintage Little Lady Patterns. I love vintage looking patterns on girls and even for myself. This is a new designer and the first time I have used their patterns. I love that they took the pics with this vintage car! 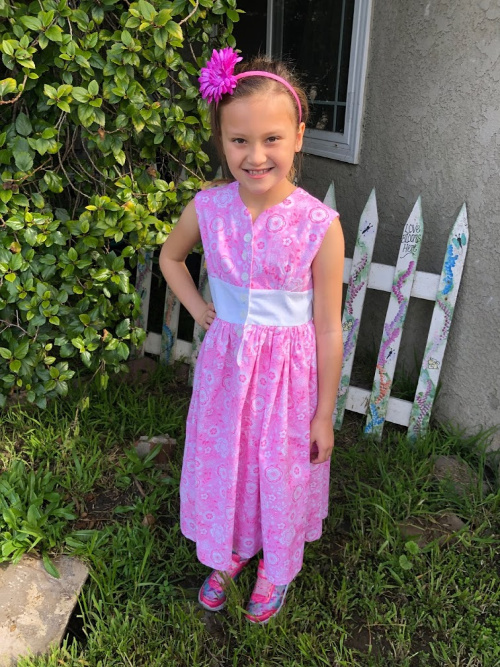 I was excited to sew this great little dress. It was fairy easy and I am sure that even beginner sewist will have success with it. The final result was perfection as my grand daughter is in love! This is girls dress called Opal and it can be done in all one fabric or you can mix and match any fabrics you like. With so many wovens available I am sure you can find one you love! With directions that are straight forward and designs that look so amazing. I am sure this designer has a winning combination. Check them out at Vintage Little Lady here! The dress is beautiful!! Great job with this! I had no idea there was someone making vintage patterns for young ones. The dress is adorable and I’m so glad your granddaughter likes it. Those vintage dresses are lovely. The models are adorable. CUTE! Love the vintage style. She looks like she really loves it, too. Love this vintage look- great model and dress! This looks so cute on her! Great job with this one!